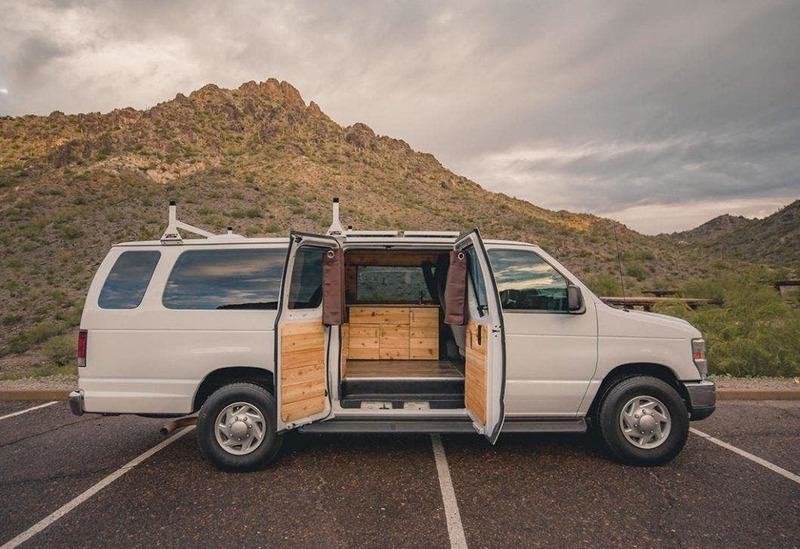 If you find converting your own adventure van daunting, the team at Boho Camper Vans in Phoenix, Ariz. can do the job in just four weeks with the vehicle search included. The company builds out comfortable, functional and beautiful camping vehicles from 1-ton commercial vans. 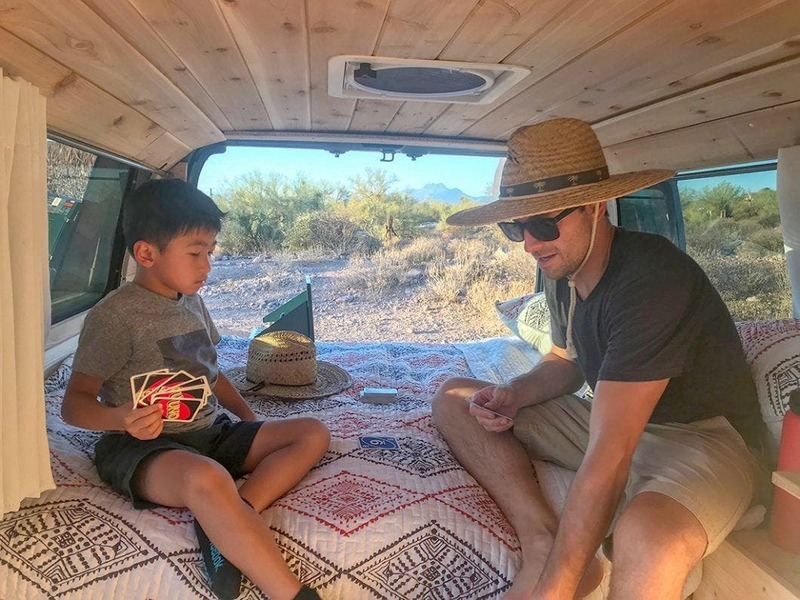 Everything is included for life on the road such as a full off-grid power system, 25-gallon water tanks, kitchens with bamboo countertops, wood paneling, vinyl flooring and full beds. The total cost for a custom van is $35,000. Various upgrades and shipping are available for an additional cost. 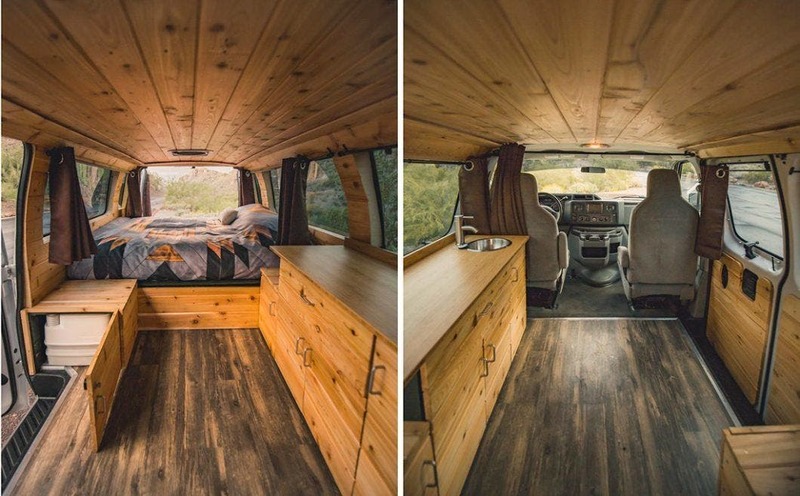 Boho Camper Vans builds and rents out custom adventure vehicles. 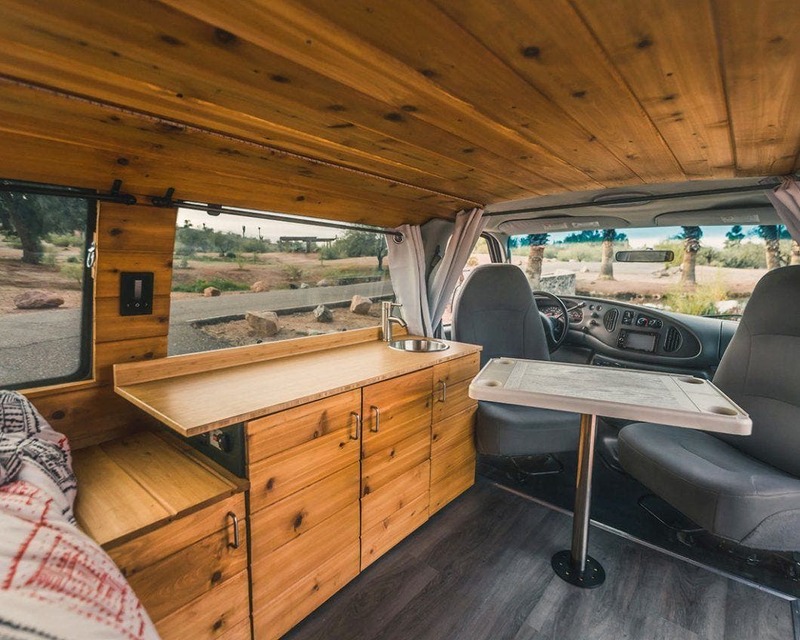 If you want to experience a Boho Camper Van before buying, several of their vehicles are available for rent on the RV sharing site Outdoorsy. Renters will even get access to the company’s “secret map” of their favorite locations. Learn more about Outdoorsy and Boho Camper Vans’ story in the December issue of the Tiny House Magazine. In addition to the magazine story, David Sodemann, co-owner of Boho Camper Vans, also gave us some background on their company. Can you tell us a little more about your first build and what you learned along the way? Our first build was an experiment as we wanted to emulate an experience Sarina (Boho Camper Vans co-owner) and I had this past year when renting a camper van in Maui. It started with finding the right van, as we weren’t looking to buy brand new vehicle. We browsed Craigslist, Cargurus, Autotrader, Offerup—basically anywhere we could find inventory. We eventually found our first model “Stevie” from a used auto dealer in Phoenix. From there it was finding the right team to make our van design a reality. I was lucky enough to have a skilled friend, Brett, who believed in the van life dream, and also had the space and tools to make it a reality. We learned much about what we wanted (and didn’t want) via online guides found on YouTube and from there we just started planning. Many van builders exclaim a build will always take much longer than anticipated. We didn’t want to delay—our goal was six weeks and we stuck to it, putting in many long nights and early mornings. We eventually completed the build on time, and hung the final curtain, minutes before our first renter took “Stevie” to the road. 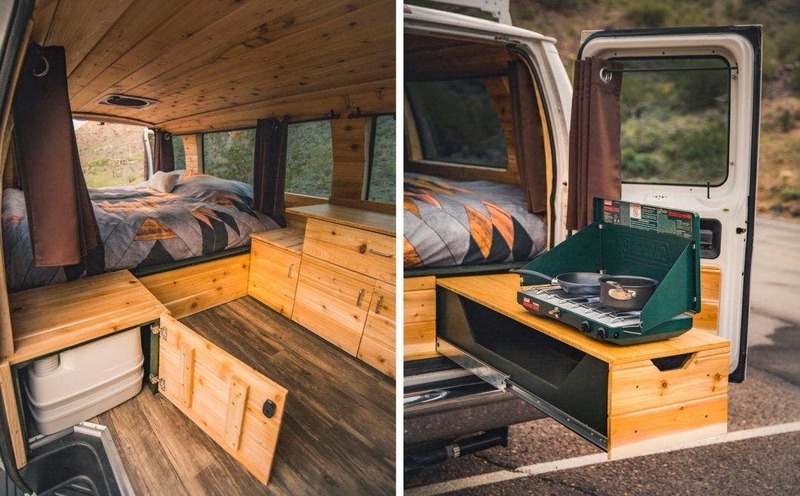 The best advice we can give for those looking to build their own van is just do it. Trust the process and enjoy it along the way. Was there a reason you chose to convert and rent out vans? Did you give any thought to RVs or travel trailers? When deciding on what type of vehicle to build for Boho, it was an obvious choice to go with passenger/cargo vans. They’re essentially a blank canvas but where space is at a premium requiring each design move to be thought-out and intentional. We wanted to create a functional, yet minimal experience, where no previous knowledge of driving/maintaining an RV was required. Anyone can drive our vans and the way we’ve designed the electrical and water systems is simple enough for even children to understand. This way, renters can focus on the experience of the road and need not worry about the tedious processes larger RV’s require. What do you personally look for in a van? When scoping out vehicles we are extremely meticulous and stingy. All vans go through multiple inspections from both our team and 3rd party mechanics. Vans must be under 100,000 miles, have zero rust, possess a 1-ton engine and have a complete vehicle history report. We will not buy anything that doesn’t fit these specifications. The goal is get as much life out of the vehicles as possible as it’s essential to our business. 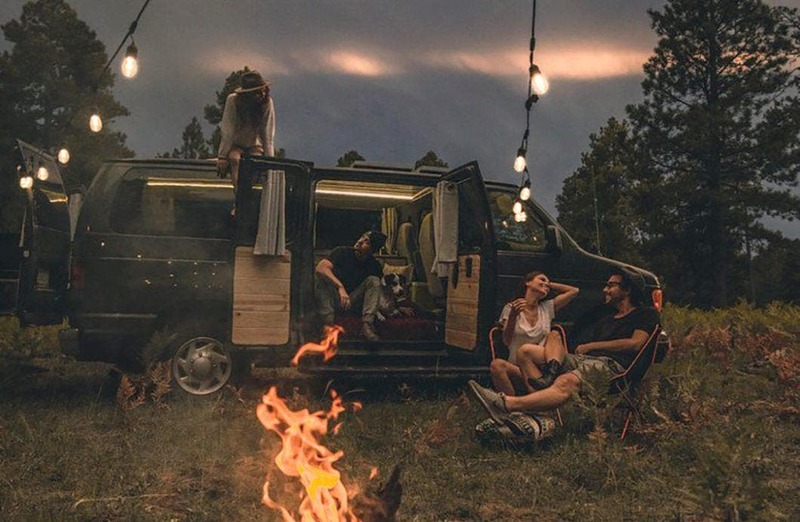 Would you ever consider living full-time out of a van? If so, what would you want in your tiny mobile house? We would love to live full-time on the road (or sea). Both of Boho’s founders are heading towards this goal. Sarina and I are working on plans to build a “schoolie” to take from Alaska and Patagonia and Brett and his fiancee have plans to sail around the world on a sailboat in the coming years. We would love to be able to have bathrooms and showers built into these models to provide us the very minimum of “creature comforts” for our life. In a world where we are continuously feed the idea that “bigger is better”, we wholeheartedly disagree. Life is about experiences and when you break free from the traditional mold that’s where growth happens. We are encouraged to see others thinking the same way and are excited about the movement towards “tiny” and more efficient ways to live.